MANA™ Food for a better life. Breakfast, lunch or dinner in under a minute. One pouch contains 2001 kcal of complete nutrition for all day long. Food for a better life. Helping busy people eat better. For only £1.40 per meal, you can have a nutritionally complete food drink that will give your body everything it needs. And its delicious, neutral flavour allows for endless tweaks and modifications. Clinically proven and laboratory tested. Free shipping for orders over £80. Whether you choose our ready-made drink or our powdered version, you’ll be saving time, money and effort. Prepare a complete meal in just 60 seconds and taste the future! One portion of Mana Powder will give your body everything it needs to get going, and keep going. One pouch contains enough powder for 5 meals. One package contains 7 pouches. For perfect preparation of Mana Powder, you’ll need our Starter Kit, which contains a Mana bottle, and a special stainless steel measuring cup. Available now for £15. 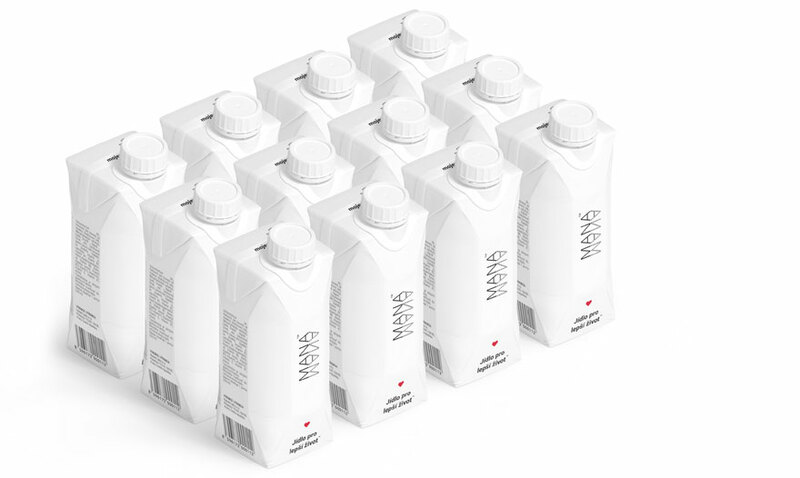 Each 330ml bottle contains a balanced meal, which will keep you feeling light and full. In just minutes, you can consume 400 kcal, which is 20% of your daily caloric needs. What if you had a solution which took the hassle out of mealtimes? What if you could just drink a nutritionally complete meal in a few seconds? It’s time to stop skipping meals and eating unhealthy when you are pressed for time. Experience Mana, your futuristic meal in a bottle. The reason why there’s nothing else like Mana. Algal lipids contain the unsaturated fatty acids DHA and EPA, which contribute to the normal function of the heart with a daily intake of 250 mg. A daily 250mg intake of DHA also contributes to maintaining normal brain function, normal vision and to a normal triglyceride level in the blood. 5 servings of Mana Powder or Mana Drink supply 1150 mg of these acids, of which 1105 mg of DHA. Isomaltulose, also known as Palatinose™, is a disaccharide providing the body with glucose and fructose. Consumption of food containing isomaltulose instead of sugar leads to a reduction of blood glucose escalation after consumption compared to foods containing sugar. Beta-glucans contained in oat fiber contribute to the maintenance of normal blood cholesterol levels. This beneficial effect is obtained when eating at least 3 g of beta-glucans per day. In Mana products, there are even more beta-glucans. Mana Drink contains 6.5 g, and in Mana Powder it’s even higher, at 9.5 g per daily dose. We use organic cold-pressed flaxseed oil. Thanks to a special technology of oxygen exclusion applied throughout all parts of the process, we avoid any unwanted peroxidation. This oil contains the highest level of the alfa- linolenic acid (omega-3) from all vegetable oils. Sunflower oil contains a high amount of a monounsaturated (MUFA)/polyunsaturated (PUFA) mixture of predominantly oleic acid (omega-9) and linoleic acid (omega-6). The oil also contains significant quantities of vitamin E and phytosterols. Corn grain is a raw material used for the production of very pure and well-structured carbohydrates, which are used in Mana to provide easily available energy and give the product a pleasant consistency and mild sweetness. This highly beneficial protein contributes to muscle growth, its preservation, and to maintaining normal bones. Thanks to the overall protein content of 20 g per serving, Mana Powder and Mana Drink are ranked among foods with a high protein content. During a unique manufacturing process, the amount of soy phytoestrogens is minimized. Soy lecithin plays an important part in Mana, due to its emulsifying and stabilizing properties. It is also a vital component used by the nervous system and brain, as well as being a source of choline, a valuable nutrient. Alpha-linolenic acid contained in canola oil contribute to the maintenance of normal blood cholesterol levels. Canola oil is a superior source of omega-6 and omega-3 fatty acids in a convenient 2:1 ratio. At the same time it is low in saturated fat and high in fat soluble vitamins and phytochemicals, such as lutein and phytosterols. We use organic cold-pressed coconut oil of the highest quality. It has a pleasant aroma, a solid consistency, and a high level of valuable, saturated medium-chain fatty acids. Containing especially lauric acid and myristic acid and only a small amount of highly saturated fatty acids, it is unique among natural oils. MANA™ is a complete food. Lactose free with sweetener. For the daily diet from 18 years of age. Intended for special nutrition. Store in a dry, cool place (max. 25° C, not in the fridge). After opening, consume till one month. Maltodextrine, Soy protein isolate, Oil mix (Sea algal, Canola, Cold pressed coconut, Sunflower, Cold pressed flaxseed, vitamin K1 (Phylloquinone), Vitamin D2, Isomaltulose, Oat fiber, Soy lecithine, Gum acacia, Salt, Minerals (Potassium (Potassium chloride), Calcium (Calcium carbonate), Magnesium (Magnesium oxide), Zinc (Zinc oxide), Iodine (Potassium iodate)), Sucralose, Xanthan gum, Vitamines (A (Retinyl acetate), B1 (Thiamine hydrochloride), B2 (Riboflavin), B3 (Nicotinamide), B5 (Calcium pantothenate), B7 (Biotin), B9 (Folic acid), B12 (Cyanocobalamine), C (Ascorbic acid), E (Tocopheryl acetate)), Aroma. Mana has been designed in our lab by an amazing team of scientists. It is based on clinical studies, and produced using state-of-the-art technology. Our formulas are based on the recommended daily intake from both EFSA and WHO, as well as more than 44 clinical studies related to our ingredients and 2 studies to our drink. We are always innovating and improving our recipe, as well as developing more sustainable ways of processing our ingredients and packaging our products. Each ingredient used in Mana is analyzed in depth in accredited laboratories. We are devoted to knowing as much as possible about the ingredients we use. Climate change is undeniable. Therefore, we are committed to running our entire operation on 100% renewable energy sources such as solar, hydro and wind by 2018. Today’s world food waste amounts to 1.8 billion tons per year. Half of all municipal waste is food and its packaging. We believe it is our responsibility to reduce these numbers by designing products which use the least packaging, as well as constantly improving the materials in order to offer the longest shelf life possible. We are committed to continuing our efforts to protect our planet Earth. We believe our planet is our home, and that the way we treat it now will have an impact on what we get from it in the future. Our goal as a company is to change the status-quo of food production and quality – from how food is grown, harvested, processed and consumed to how its packaging is recycled. To create a better world, we have to start with ourselves, which is why Mana is dedicated to following these values from the concept phase to your doorstep. Enjoy Mana as part of a balanced diet and healthy lifestyle. Mana is suitable for all healthy adults.